6.47 points at 15 votes (rank 525). Optically, Drelbs first reminds of a freaky version of Lady Bug paired with 'dots and boxes'. 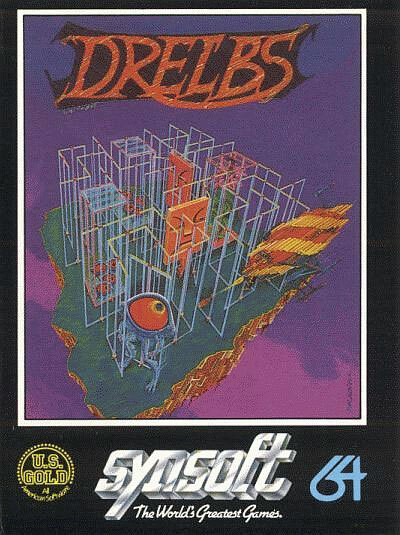 Drelbs is skill game by Synapse Software from 1984. The player tries to arrange revolving doors in a way so that squares are formed in which ports can appear. These ports allow to enter an intermediate sequence which then allows you to enter the next level. Different enemies and a rising game speed aggrevate this undertaking. …a long long time ago (when there were still magicians, unicorns and such things), lived a people of suqirrelly manikins named Drelbs, in a kingdom that was so microscopically small, that even a flea would not have noticed it. Hardly a small cloud was able to blur the sky over this place full of light and love and the Drelbs lived along calmly and came and went as they wanted. Until one day, driven by envy and evil deceitfulness, the log-headed Trollaboars – darksome gnomes of squared figure – occupied the land with their screw head tanks. They chased the Drelbs and locked them one after the other into the dark corridor, a place free from all light, where they were guarded by the no less horrible Gorgolytes. In the role of the last self-determined Drelb, it is now the task of the player to lure the evil intruders into the ”Atomic Flip Grid“ in the heart of the land and release the captured companions from their anguish. Speed and cunning are the motto of the hour or the extinction of the Drelbs is certain. Go on with courage, the Drelbs keep their fingers crossed (or the toes)! Gorgolyte grimaces, the "Mystery" Lady and a "Drelbic Window into the Dark Corridor" can appear in the completed squares. This cute companion is the hero of the game. Although the story only mentions one surviving Drelb, he has five lives. By skillful use of the joystick it is possible to turn the revolving doors in the “Atomic Flip Grid“ so that a square forms. First, this gets you points and second, with a higher number of squares rises the chance that something special forms inside – that is either a Drelbic Window into the Dark Corridor, the face of a mysterious lady or the sneering mug of a Gorgolyte. The latter is dangerous, because if you stumble into it during all the hectic, you will lose a screen life. Agility and endurance are rewarded with an additional life every 10.000 points. A level is finished successfully when you have made it to free all the captured Drelbs from the Dark Corridor. The Drelb may be small, but it is powerful: here he locks his pursuer by every trick in the book into a square, which it obviously does not like very much. To make it not so simple, the Trollaboars chase the Drelb through the labyrinth - first, only one, in later levels more. They can also move the revolving doors. To buy some time, the Drelb can imprison his pursuer by closing a square, in which a Trollaboar lingers at that moment. But this doesn’t last very long and after a few seconds the fiend brakes free again and continues his chase. There are also periodically appearing hearts that paralyse the Trollaboars for a short time, which makes locking them easier. Quick as a flash jumps the Drelb into the Drelbic Window and frees his companions from the Dark Corridor. The darksome Gorgolytes guard the imprisoned Drelbs in the Dark Corridor. They cannot directly harm the Drelb in the “Atomic Flip Grid“, but he can run into them by lack of the player’s eye-hand-coordination, when they show in a completed square. In every square with the face of a Gorgolyte there is the possibility that a "Drelbic Windows" opens to the Dark Corridor for a short time. If the player uses this moment, he will be teleported there and free the Drelbs in there by walking over them. The previously cold-blue frozen companions then change the colour to red and whoosh with breakneck speed and an adequate sound (Vooom!) to the border of the screen. 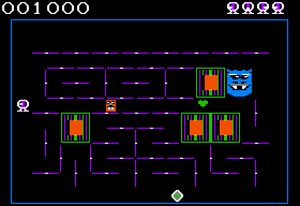 Depending on the level, the corridor is guarded by one or more Gorgolytes, which can be very well dangerous for the player here, be it by direct contact or by the projectiles they shoot. Here one needs to take into account that Gorgolytes always shot horizontally and vertically in turns. When the last Drelb is freed, there are bonus points and the game gets a bit more difficult than it is already. But if the Drelbs gets caught, he will be brought back to the ”Atomic Flip Grid“ and he needs to find a new port. Another method to open a “Drelbic Window“ is to collect the blue diamonds , which as the blue hearts appear only occasionally. A long-lasting port form and additionally all Trollaboars are freezed. Violet with pink was an imaginable colour combination in the eighties and so it isn’t any wonder that these worm-like creatures, which the manual describes bloomily as Screw Head Tanks, carry this today rather precarious choice of colour. They patrol the outer rim of the “Atomic Flip Grid“ and release missiles every now and then, which can rebound from the revolving doors or squares according to the principle arrival angle = emergent angle. Of course the Drelb must beware of these ricochets as much as of the nasty worm himself, which even gets companions from its own rows in the higher levels. What's her business here anyway? A fair maiden in time of need? Drelby does not vacillate and jumps selflessly at the chance as well as a heap of bonus points. This irritated and sad beauty appears just as the Drelbic Windows only shortly in the squares that show Gorgolyte faces, You should use this moment to give her a kiss, which is rewarded with a charming smooching noise, screen flicker, a siren sound (what else?) and a spontaneous jump to the bonus sequence. After that, the game continues normally in the level, that has been reached then. "YAY, CUTIE!" – All’s well that ends well and as many points as you can carry. 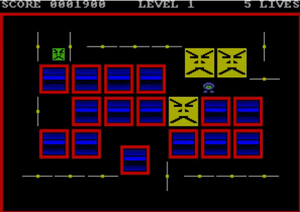 The game has 8 levels and is with this playable to the end as many games by Synapse Software. The levels are inventively named after jewels (sapphire, ruby, smaragd, topaz, peridot, agate, amethyst...stop, these are only seven?). Most of the time, the game ends in a highly embarassing explosion of faces of locked Trollaboars and Gorgolytes accompanied by a crazy cacophony of ”strange“ blubber sounds. But if you make it thanks to truly drelbic courage and skill or cheating (boo!) to the end, you will be rewarded with a rain of hearts by the “mysterious lady”. The Drelbs are free and you are a hero. There is nothing more to want. The graphics of Drelbs oscillate somewhere between "not nice but rare", "I am irritated…" and "yuck, what a choice of colours!" and adapts mostly to the average standard of arcade games in this period. But there are some more laboriously designed, selectively applied, confusing sequences, as e.g. the swirl when entering the Dark Corridor, the bonus sequence or the "overloaded" Game Over-screen. Furthermore, the faces of the Gorgolytes that appear in the squares cause on TV sets interesting moiré effects due to their build-up. All in all one does not get rid of the feeling that the slight psychedelic elements have been used intentionally. The sound effects are a conglomerate of surreal sounding bleeps, clonks and swoops (or so...) and integrate themselves perfectly into the frenetic-bizarre hustle and bustle on the screen..Just as appropriate is the monotonous sound sequence that is supposed to represent the ingame music, which starts first slowly and later gets faster and faster with rising action. Press F3 to call up the menu for choosing the difficulty, choose the difficulty with F5 , then F7 to start a game with the chosen difficulty level. Space to pause the game. Return to the game by moving the joystick. Just play incredibly well and don’t let yourself get caught, it is as simple as that...haha! The version by Remember has next to several trainer options and bug fixes also a build-in documentation (which you won’t need any more after reading this exuberant, super-duper game article). Robotron2084: "Games with a shaken dose of lunacy and unusual game concepts just call out for me, and so does Drelbs. There are a lot of things packed into this game: lovely obliquity, comical sounds and strange graphics mixed with fast gameplay, funny details and atmosphere. When the speed is raised to the threshold of pain at level 4, there is not a dry joystick in the house. For me Drelbs belongs to the top titles by Synapse, a brilliant example for fearless originality from the early phase of the C64 game history. 7.5 of 10 points." Bamse: "Played it again and again at the earlier times – and then for very long! 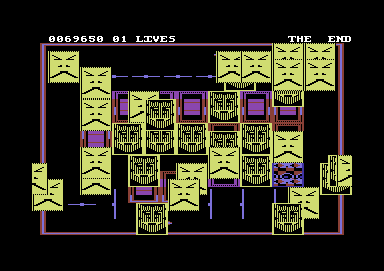 At the latest in level 5 the bustling enemies start to make every nice rectangular planning impossible. Then it is only about avoiding, you better make your (bonus) points earlier. Seven points for this creative idea." According to the monster manual of the fantasy role game AD&D a Drelb (or also "haunting guard") is a negative energy creature (Energon), that lives on the Negativ Energy Layer. They resemble ghosts, but are not undead. The Atari 8-bit version shines with slightly faster gameplay, but has reduced colours and in return (of course) shriller sound. 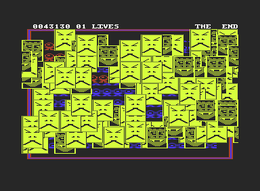 On the Apple II Drelbs looks ”astonishingly“ different. A fan version for the Amiga, also here graphics were cut down. 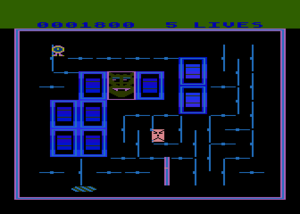 The Atari 8-bit version shines with slightly faster gameplay, but has reduced colours and in return (of course) shriller sound, while the Apple II version looks astonishingly different. In the version for the Amiga also graphics were cut down. This page was last modified on 2 March 2019, at 06:09.